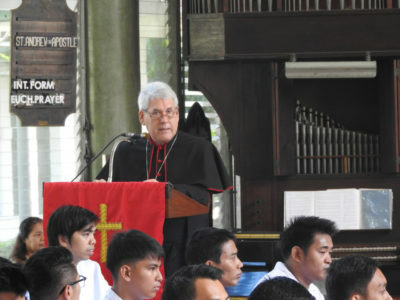 A sermon preached at St Andrew’s Theological Seminary, Manila on St Andrew’s Day, 2016. It is an immense honor for me to stand here among you on this feast day of St Andrew, and it is with a deep sense of privilege that I bring you greetings from the Christian community in the Holy Land, in Bethlehem, in Jerusalem, and in Nazareth. Greetings in the name of Jesus our Lord from your sisters and brothers in Palestine, and Israel, and Jordan, and Lebanon. Greetings, in particular, from Archbishop Suheil Dawani, the Anglican Archbishop in Jerusalem. The land of the Holy One, the land that Jesus knew, is now divided among four nations. It is the one land, with two peoples, and three faiths. The Christians of that land give thanks to God for you, and they ask you to remember them in your prayers. They do not ask you to take side in their national, political, and social conflicts, but they do ask for your solidarity in Christ as they seek to be faithful people of God in their land at this time. And they make the same prayer for you here in this land at this time. It is sad but true that Andrew’s connections with Bethsaida are not often considered. Sadly this is true even for someone such as myself who is one of the co-directors for the Bethsaida archaeology project. We tend to focus on Bethsaida as the city of Simon Peter and the city of Philip, but not to give much thought to Bethsaida as the city of Andrew. That is an oversight I regret, and the invitation to be here with you today offers me an opportunity to make amends! After 30 years of excavations at Bethsaida we have a pretty good idea of what Andrew’s town was like. It was located at twelve o’clock on the Sea of Galilee, right next to the point where the rapidly running waters of the Jordan River flow into the still waters of the lake. After dropping 3000m from the Lebanese mountains to the lake, the water is moving at a pace and carrying lots of silt. As it meets the lake it loses its momentum and drops its load of soil and nutrients at the northwestern edge of the lake. Over time the silt accumulates. The water slowly becomes shallow. It is warm. It is rich in nutrients. It creates the fish breeding grounds of the Kinneret then and now. This slow physical process created Bethsaida, and its was to destroy it as well. Andrew lived in Bethsaida at a time when its natural advantages as a fishing village had expired. As the delta in the NW corner of the lake grew in size, Bethsaida found itself cut off from the lake. A fishing village without access to the lake is a village without a future. Andrew was proactive in the face of adversity. Together with his brother, Simon—and perhaps other fishing colleagues from Bethsaida—Andrew relocated to Capernaum. It was not a long journey, But it was on the other side of a deep political divide. That is a story to which we shall need to turn shortly. Andrew’s name reflects the character of Bethsaida as we have come to know it from its material culture that we have unearthed in our excavations. Once the capital of the Aramean kingdom of Tsur during the Iron Age, this village had never been an Israelite town. It was always a border town, in the foothills of the Golan. We can trace the contours of its culture and its political fortunes as we sift through the layers of Iron Age city and then the new village that was established by settlers from Tyre and Sidon in the Hellenistic period. For a hundred years and more after the conquests of Alexander the Great, this was a frontier village on the northwest boundary of the Ptolemaic Kingdom. It then came within the Seleucid Empire, and we can trace the change of administration in the coins at Bethsaida that now celebrated Antiochus rather than Ptolemy. Finally, not long before the time of Jesus, it became a Jewish outpost as Herod the Great completed the unsuccessful attempt by the Hasmonean to impose Jerusalem control on this northern edge of the biblical lands. The village had become Jewish, as we can see from the Herodian oil lamps, the limestone vessels, the Herodian coins, and from the deliberate desecration of a small pagan temple from the second or third century BCE. But the town retained some vestiges of its non-Jewish past. Following the death of Herod the Great in 4 BCE, the north east corner of his kingdom was assigned to one of his three surviving sons: Philip the Tetrarch. Another son, Antipas, was assigned the fertile country between the Sea of Galilee and the Mediterranean as well as the territory of Perea on the eastern side of the Jordan River (opposite Jericho). The two sons engaged in a long running competition for Roman endorsement as their father’s heir, and each aspired to the title, “King of the Jews”. Bethsaida was destined to play a role in that conflict, even though it was too little too late for Philip. And this takes us back to the political divide between Bethsaida and Capernaum that I mentioned earlier. Non-Jewish traditions flourished in Philip’s jurisdiction, as we see from his coins which feature the head of the Roman emperor and (just once) his own image. Neither Herod nor Antipas ever issued coins with such images, which were deeply offensive to pious Jews. In the far north of his territory Philip was delighted to have inherited the Augusteum, a temple in honor of the divine Emperor. This building at Caesarea Philippi, the city Philip built for Caesar, featured on most of his coins. and it celebrated pagan traditions connected with the emperor cult. A year after the execution of Jesus (on the first anniversary of the death of Julia, mother of Tiberias), Philip transformed Bethsaida into a Greek city with the name, Julias. He most likely rededicated the Hellenistic pagan temple as a shrine in honour of the divine Julia. Sacred images of Julia have been recovered from the site in our excavations. So Andrew of Bethsaida is not just a fisherman from a small village on the northern shore of the Sea of Galilee. He carried a Greek name and will have lived through times of significant social change in his home village. But there is more to Andrew than an interesting multicultural zip code. At this point we shift our focus from Philip the Tetrarch to his brother, Herod Antipas. Antipas was in many ways a worthy candidate for his father’s throne. He was ambitious and calculating. Jesus called him “that fox” (Luke 13:32). After initially rebuilding Sepphoris to be the capital city of his new jurisdiction, by 18 CE he has moved to a new project. With the succession of Tiberius as emperor after Augustus, Antipas decided to found a new city on the western side of the lake. He named it Tiberias and the centre of gravity for his administration shifted from Sepphoris to the lake. He taxed the fishing industry hard, as it was one of the few natural resources at his disposal. Tiberias lay then (as now) at the southern end of the fish breeding grounds in the NW corner of the lake. Capernaum and Migdal to the north were key centres for the fishing industry. Despite the burden of these heavy taxes, Andrew relocates to Capernaum. Along with Peter—and perhaps also James and John, the sons of Zebedee—Andrew chooses to live in the jurisdiction of Herod Antipas. But there is more to the story of Andrew and Antipas. Andrew was also a follower of John the Baptist, and John was critic of Antipas. His criticism of Antipas for divorcing his own wife to marry the wife of his brother, Philip, was to cost John his life. Andrew has relocated from Bethsaida to Capernaum, but in John 1 we find Andrew among the disciples of John the Baptism in the southern area of Antipas, at Bethany-beyond-Jordan, on the eastern side of the Jordan River. This suggests that Andrew had been drawn into the prophetic renewal movement associated with John the Baptiser. Andrew—along with his brother, Peter, and at least one other person from Bethsaida, Philip—had travelled down to the southern end of the Jordan Valley to participate in John’s mission. One thing we can be sure of: this was not a fishing expedition! Like Jesus himself, Andrew and his close associates from Bethsaida had been drawn into the crowds responding to John’s preaching in the wilderness. He was already on a spiritual journey before he encountered Jesus. And that journey was political as well as religious. To associate with John was to oppose Antipas. Then we see Andrew among the first to shift his allegiance from John to Jesus. After that, Andrew tells Peter that he has found the Messiah. In the classic turn of phrase, “he brought Simon to Jesus.” Not a bad achievement for the first convert of the ‘first-called’. Later in John’s Gospel, Andrew will bring to Jesus the small boy with the five barley loaves and two small fish (John 6:6–10), and then he and Philip will go to tell Jesus that some ‘Greeks’ are wanting to meet him (John 12:20–24). Apart from being consistently named among the Twelve, there are two other traditions about Andrew in New Testament. In Mark 1, Andrew is described as jointly owning with Peter the house in Capernaum that we tend to call “Peter’s house”. This house became a place of hospitality and healing, a place of teaching and wisdom, and the place that Jesus himself would call home. Finally, in Mark’s version of the apocalyptic discourse (Mark 13:3), Andrew is named among the inner circle of disciples who ask Jesus to explain his teaching on the end of the world. Andrew of Bethsaida then disappears from our sight, and is never included among the “so-called pillars” of the church in Paul’s correspondence. We have no reliable information about him after Easter, although that has not prevented Christians in various parts of the world claiming him as their patron saint. What thumbnail sketch of Andrew emerges from this survey of archaeology and text? What wisdom for our journey of faith? What insights for our mission? Andrew was grounded in his own faith tradition. He also lived in a pluralistic community where his tradition was not the only option. Andrew of Bethsaida lived in a mixed community with Jews and pagans, and his own name reflects the cultural and religious diversity of Bethsaida. He lived at time when ecological changes in the local environment made traditional life difficult, and required him to relocate to a more sustainable location. Andrew never forgot his roots even when creating a new future for himself and his family. He lived in a time of political tension as the surviving sons of Herod the Great pursued their personal political ambitions with no regard for the people under their rule. Andrew was drawn into the Jewish renewal movement led by John the Baptist, and traveled to the southern end of the Jordan valley to explore what this might mean for him and for his family. He was not content just to be a passive participant in the crowds that came to hear John, but we find him spending time in John’s company and seeking to go deeper. Andrew was with John when Jesus walks by and decides to go after this stranger of whom John spoke so highly. With the patience of an experienced fisherman, Andrew spends a whole day with Jesus: observing, listening, asking questions. Andrew becomes the first-called, the first person we know who was called to follow Jesus. He embraced the call to be a disciple, and he invited others to do the same. This is the person we celebrate today, and this is the legacy we claim as our own. The Jesus who called Andrew, calls us. May our response be as strong as Andrew’s, and as true to our own context in this place at this time. This entry was posted in Sermons, St George's College Jerusalem, Uncategorized. Bookmark the permalink. All the best. Am hopeful you may be returning to Australia ?